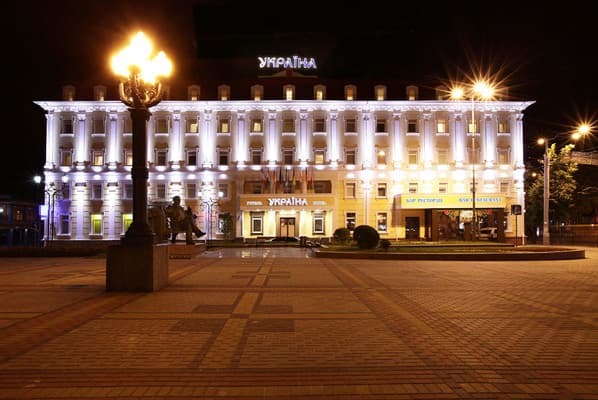 Hotel "Ukraine" is located in the center of Rivne at Theatre Square. 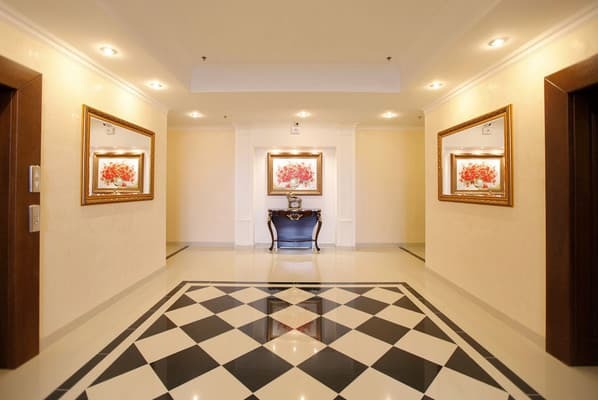 The successful placement of the hotel allows you to reach quickly and easily anywhere in the city. 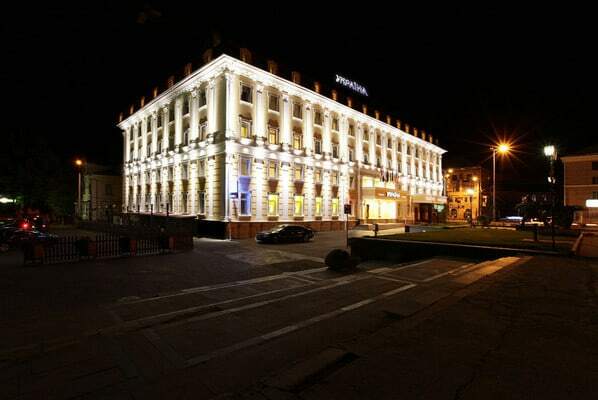 "Ukraine" hotel is a five-storey building and is one of the oldest hotels in the city. The hotel corresponds to the European level of service and the best traditions of hospitality. Hotel Rooms in 70 rooms of different categories. 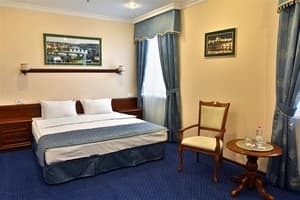 All rooms are in good repair, made in classic style and equipped with everything needed for a comfortable stay. It offers - free Wi-Fi. Next to the hotel "Ukraine" is a parking where you can leave the car. 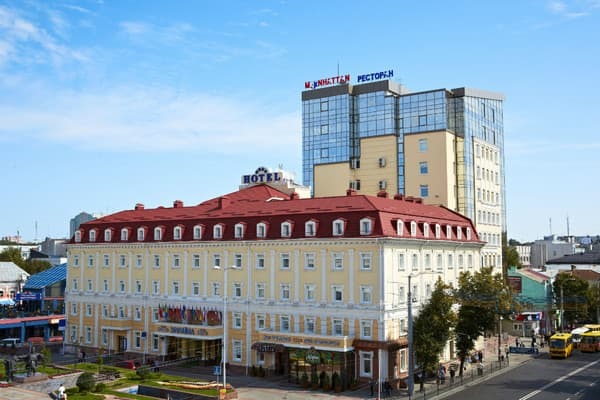 In the hotel there is restaurant of Ukrainian and European cuisine, as well as a sauna and a pub. The price includes breakfast (buffet). The distance to the bus station - 3.5 km, to the train / railway station - 2 km. Description of the room: Design of the rooms is decorated in the style of modern classics. 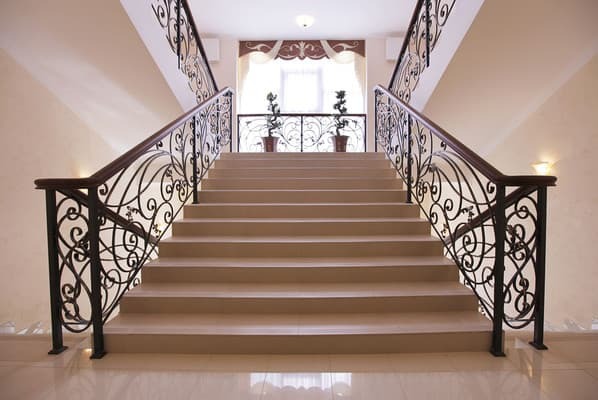 The room is equipped with natural wood furniture Ukrainian production and a comfortable bed (1800h2000 m). Area from 10 to 15 sq.m. 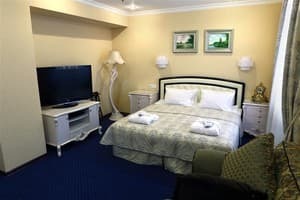 Description of the room: Room with a double bed (1800h2000 m), equipped with everything necessary for a comfortable stay. Classic interior rooms decorated in bright, warm colors. This room features an ergonomic work space, which is especially important for guests who are traveling for business. The total area of ​​15-16 sq.m. Description of the room: Room with twin beds (900h2000 m), equipped with everything necessary for a comfortable stay. Classic interior rooms decorated in bright, warm colors. This room features an ergonomic work space, which is especially important for guests who are traveling for business. The total area of ​​15-16 sq.m. Description of the room: The rooms are spacious Junior Suites (22 square meters), bright and homely, equipped with everything you need: elegant furnishings, a comfortable bed (1800h2000 m). The room also features a kit for making tea and coffee. The room has the ability to accommodate a family of three. Description of the room: A spacious room, with a total area of ​​23 square meters, decorated in warm colors and classic style. The elegant furniture, large beds, sofas and delicate flower arrangements create an atmosphere of refined relaxation. Description of the room: Two-room area of ​​43-46 sq.m. The living room is equipped with everything necessary for business meetings or a relaxing holiday (refined interior and live floral arrangements complement the impression of unsurpassed style); bedroom with a comfortable bed. Description of the room: The presidential suite area of ​​46 sqm, consisting of an elegant living room in a classic style with fine furnishings and the most modern means of communication and a bedroom with a big comfortable bed. The room is an additional guest bathroom and a large walk-in closet. Хороший, уютный, недорогой отель с завтраком на твердую 4+. Соотношение цена-качество превосходное. Хорошая кухня в Айриш пабе. Чисто. Есть стоянка для авто. Рекомендую. Уютно, современно, чисто и комфортно в номере. Центр города. Вкусная кухня. Отзывчивый и доброжелательный персонал. Гостиница полостью соответствует 4м звездам. Безупречный сервис (начиная с парковки), добротный номер, хорошее расположение. Плюс завтрак-шведская линия. И цена более, чем приемлемая. Остались очень довольны. Всё понравилось. Мы - путешественники со стажем (лет 10, восновном Европа) были приятно удивлены. По нашему мнению, отель полностью соответствует заявленным 4-STAR. Очень тихо и спокойно. Месторасположение просто потрясающее. Удобная "скрытая" парковка. Везде чисто. Завтраки хорошие - шведский стол, нормальный выбор. Отличная гостиница. Комфортная, в самом центре. Сплошное удовольствие! Завтрак не понравился. Привык к шведскому столу. Но дело вкуса. Расположение просто центровое. Интерьер - ни чего лишнего, только стиль. Чисто, сухо и комфортно. Услуги оценить не довелось но думаю, что будут на уровне. Children under 6 years free of charge without extra bed. 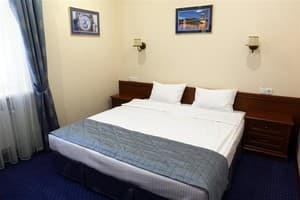 The rooms are junior suites there is a possibility of additional beds for a fee. At the hotel there is restaurant of Ukrainian and European cuisines. The bus station can be reached by bus №64, №53.